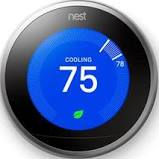 The Nest Home Thermostat Now Available at Mary’s Appliance!!! Live demo in store!!! Mary’s Appliance offers installation, with Installation from Mary’s you will receive a 5 year warranty on your new thermostat for free!!!! Nest offers other great product such as security camera’s. All Nest products can be ordered if not in stock!! !